Rain means you can't use power tools - unless you have a death by electrocution wish. 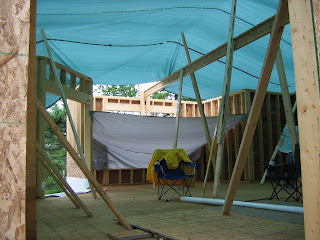 After 2 days of rain, and not getting much accomplished, we erected a makeshift roof with a huge tarp and a few poles to suspend it above the walls. 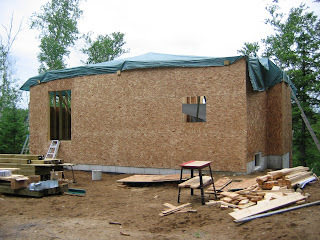 It worked well enough that I could continue to work inside - under the big top - to do the framing of all the interior walls.